Russia is set to play a key role in balancing the global gas market in the early to mid 2020s given 100 bcma of existing shut in production capacity. Oversupply: There is a temporary oversupply due to committed global LNG liquefaction capacity, with 145 mtpa (200 bcma) coming online between 2015-2021. Demand growth: That oversupply will be eroded by LNG demand growth, particularly from emerging Asian buyers (e.g. China & India). Re-balance: Demand growth is likely absorb oversupply at some stage over the next 3-5 years, depending on the rate of Asian growth. 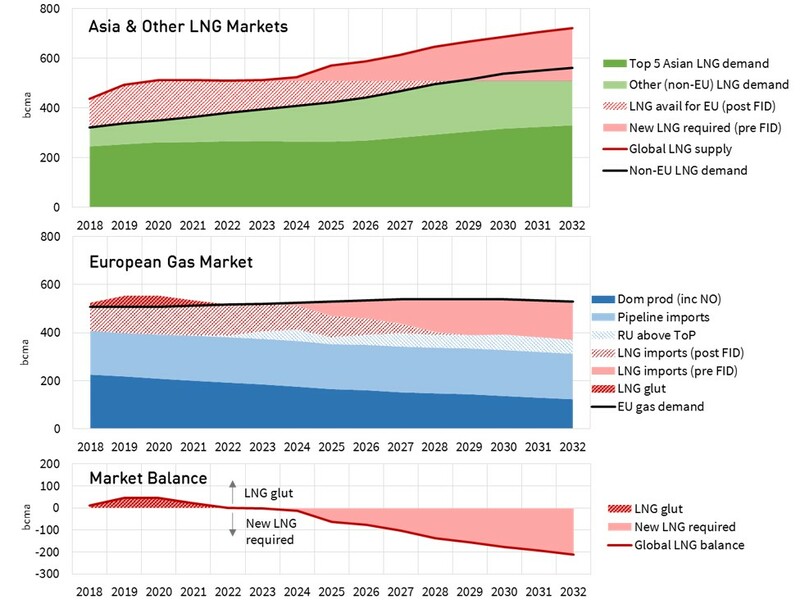 New supply: At this stage, in the early to mid 2020s, new LNG liquefaction capacity will be required onstream to prevent a shortfall in the global gas market. We agree with steps 1 to 3. But step 4 oversimplifies the dynamics around a requirement for new LNG supply. Why? In a word, Russia. By 2021 the global gas market will have 67 mtpa (90 bcma) of destination flexible, spot price responsive US LNG export capacity. This comes on top of substantial existing diversion flexibility in European LNG supply contracts (e.g. as was exercised to balance the global market across the 2011-13 post Fukushima period). In this environment, it is difficult to define a credible scenario where Asian and European spot LNG prices diverge on a structural basis. There will be periods of short term price volatility, given delays in supply chain response time to spot price signals (e.g. 2 to 6 weeks). But any structural price divergence can be arbitraged by flexible supply. In this new world, Russia can balance the Asian LNG market by increasing exports of pipeline gas to Europe and displacing flexible LNG supply. This puts Russia in a powerful position as the global market rebalances. We illustrate global rebalancing dynamics with a scenario of global supply and demand balance evolution in Chart 1. The chart shows liquid European hubs playing a key role in absorbing the temporary oversupply of LNG (primarily via gas for coal switching in the power sector). The bottom panel illustrates the global LNG market balance. Under the scenario shown (which assumes a lower Asian demand growth trajectory), oversupply is absorbed by 2022. But significant new volumes of LNG liquefaction capacity are not required until 2024. The reason for this hiatus is Russia’s ability to flow up to 100+ bcma of existing ‘shut in’ gas production capacity (73+ mtpa equivalent). This shut in production capacity is located in West Siberian gas fields developed by Gazprom late last decade in anticipation of higher European demand growth. Loss of Russian domestic market share from Gazprom to other Russian ‘independents’ (mainly Rosneft, Lukoil and Novatek) has also contributed to the volume of shut in gas. Gazprom has historically chosen not to flow this gas at price levels below existing long term oil-indexed contract prices. To do so would have acted as a catalyst for hub versus contract price divergence and development of hub liquidity, both of which Gazprom has considered to be against its strategic interests. However over the last 12-18 months Russia has made a notable shift towards pursuing market share and adopting a more flexible stance on spot price indexation (e.g. via allowing TTF price corridor structures in a number of its long term supply contracts). This may mean Gazprom defends a higher European market share (e.g. 160-170 bcma) than it has historically targeted (~150 bcma). But it still appears to be against Gazprom’s interests to push large volumes of new gas into Europe prior to global re-balancing. This would only induce a ‘bloody’ short run marginal cost driven price war e.g. by attempting to shut in US export capacity at sub 4.00 $/mmbtu European hub prices. Instead, this surplus of ‘shut in’ gas puts Russia in a strong pricing position once the current LNG oversupply is absorbed. As long as Gazprom sells this gas into Europe at a sufficient discount to new gas supply project LRMC, it can delay marginal new LNG supply (e.g. in the form of ‘second wave’ US export projects). This ability to delay new liquefaction projects is only a temporary situation. The extent to which Russia can exercise its power depends on the rate of global demand growth. It also depends on the volume of new LNG liquefaction capacity that is committed (i.e. progresses past FID) over the next 5 years. Once new liquefaction capacity is committed, Russia needs to compete with it on an SRMC rather than an LRMC basis (given sunk costs). For these reasons it is unlikely that Gazprom manages to export the full 100 bcma of incremental production capacity to Europe. Russian influence is likely to be limited to a 3 or 4 year period. This may only be 1 or 2 years if you assume robust global demand growth and early FIDs of new liquefaction capacity. But a production volume this large definitely has the potential to disrupt a smooth transition from oversupply to deficit in the LNG market (implied in step 4. of the logic in the first paragraph). And the threat of this disruption impacts FID decisions on new LNG projects today. Beyond this temporary influence of Russia, the LRMC of new LNG supply is set to reassert its influence on global gas pricing. But the capital structure and business model for delivering the next wave of new liquefaction capacity is likely to look very different to the current wave of supply. We will come back to explore this dynamic in more detail shortly.